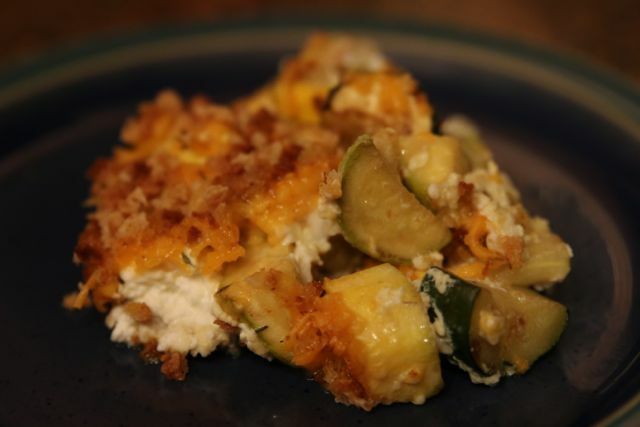 Amazing squash casserole. It’ll make you a believer. It’s been nearly a week since my visit to Bernice Garden Farmers’ Market. Although I seem to be growing Hardin Farms squash out of my ears, I still had quite a bit left today. Thing is, I don’t even like squash casserole that much. It’s usually really soft and squishy. And really oniony, which doesn’t always agree with my tummy. And kinda bland. 1. First, to tackle the squishy squash problem. Most recipes require boiling the veggie. Um, how about not. Let’s try sautéing instead, over fairly high heat. This will give the squash some nice caramelization while cooking it just a bit, not to death. 2. Next, the onion. Freshness matters, so I used one from the North Little Rock Community Farm, also at the Bernice Gardens market. Cooking it way down helps me be able to eat it, so after a small dice I added it to the same pan in which I had sautéed the squash. 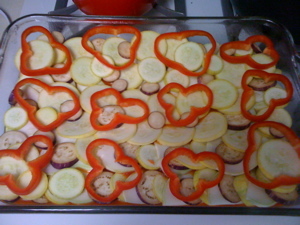 (The veggies had since been moved to a buttered casserole dish or individual baking dishes if you are making a lot.) I immediately added a half-cup of chicken broth and a good pinch of salt, both of which will help soften the onion and cook it to translucent without burning. 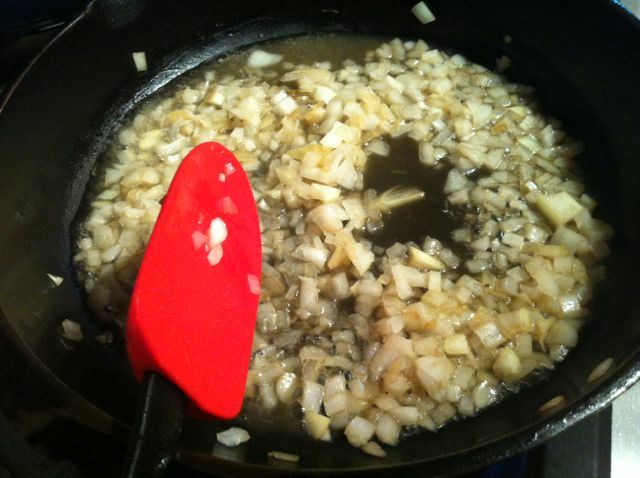 When the onion was almost ready, I added one large clove of garlic, minced. 3. Lastly, I added flavor and creaminess using low-fat cream cheese. Borrowing from Crescent Dragonwagon’s renowned recipe for Featherbed Eggs, I cut half a block of cream cheese into cubes, 12 total, and pressed them down into the casserole dish of squash. Because, really, what can’t be improved by cream cheese? The finished casserole, plated in all its delicious glory. For the entire recipe, see below. But know this…I don’t like squash casserole, and I just ate three plates of this stuff. 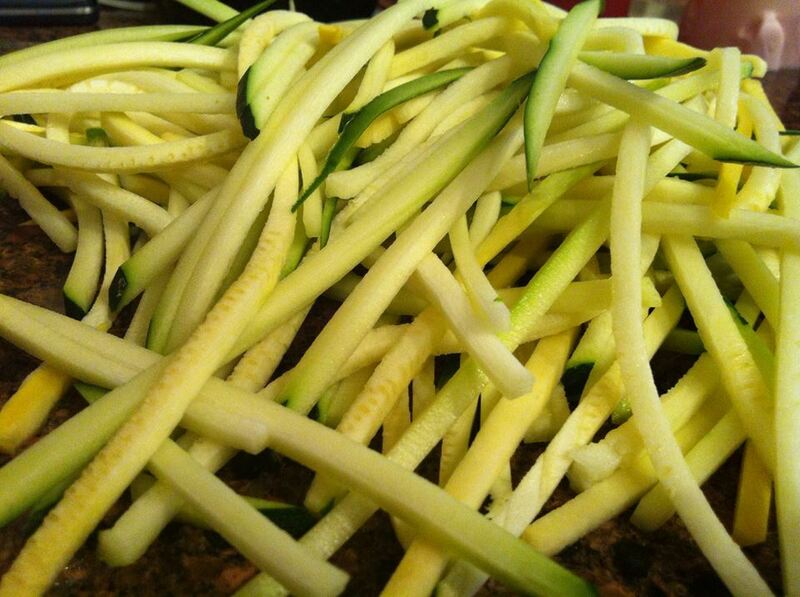 Slice squash into approximate 1/2″ pieces. For larger squash, quarter them before slicing; halve smaller ones. Butter the inside of a large, oven-safe casserole dish. Sauté the squash over medium-high heat with a half-teaspoon of olive oil in multiple batches, only using enough squash each time to cover the bottom of your pan. Cast iron works well for this. Place the squash in a single layer and let it sit for about a minute, then stir to turn and let sit another minute. Once the squash is sautéed, move each batch to the buttered dish. You may need to add a bit more oil with subsequent batches to prevent burning. Next, place the diced onion, broth and a heavy pinch of kosher salt into the empty pan; no need to clean any residue from the squash. Cook over medium heat, stirring frequently. Add more water or broth as needed to avoid burning the onion when it dries out. Add the minced garlic when the onion is almost translucent and cook another minute. Stir the mixture into the squash in the casserole dish. Press the cut cubes of cream cheese down into the casserole dish, nestling them slightly under the squash mixture. In a small bowl, whisk 1/2 c. chicken broth with three eggs. Pour the mixture over the casserole. 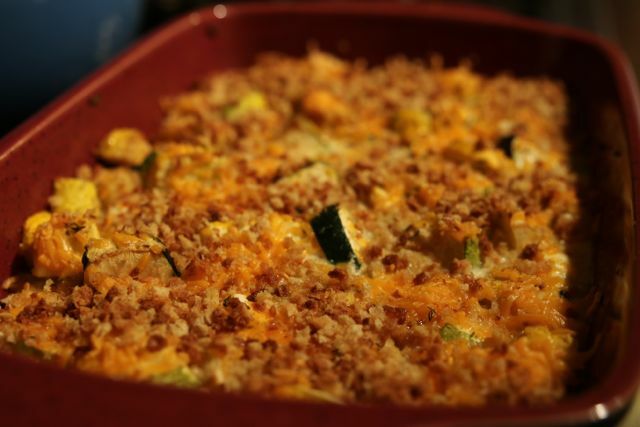 Top with fresh thyme, cheddar cheese and bread crumbs. Bake at 350 degrees for 40-45 minutes, or until the egg mixture is no longer liquid. 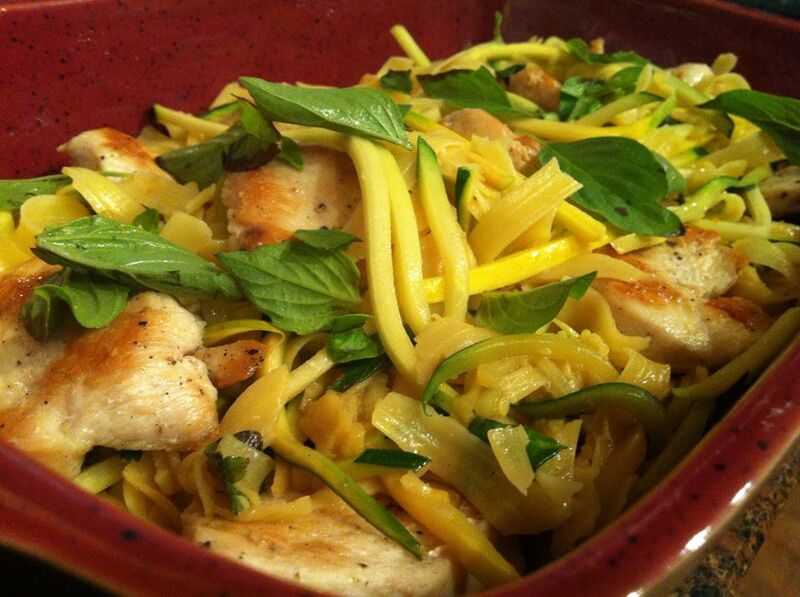 Browned butter squash noodles with fettuccine, lemon basil and chicken. As mentioned previously, I visited the Bernice Garden Farmers’ Market on Sunday to load up on veggies. 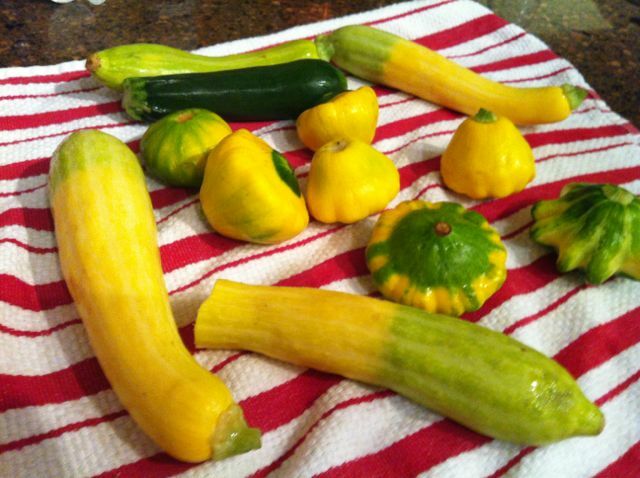 One of my wonderful finds was a huge load of Zephyr and zucchini squash from Hardin Farms. I’ve used them a few ways already, but I think tonight’s dinner gets a special mention. First, I cooked some gluten-free fettuccine noodles (Le Veneziane, the only kind worth using in this), just three of the six nests in a package, to al dente in salted water. I held it in a colander in the sink, tossed with a bit of olive oil, until everything else was ready. Results of the amazing DeBuyer mandoline. Not sponsored, just true. I’ve had my trusty DeBuyer mandoline for years, but I’d never used it to make veggie noodles. Before I ran out to buy one of those fancy noodles machines I’ve seen lately, I decided to give it a shot. Using just the right combination of the two reversible blades, I got these babies. Amazing, crunchy, long squash noodles. I ate a quarter of them before I ever got around to cooking them or anything else. I used three largish squash, finding that the larger ones are easier to run across the mandoline. I will tell you this: real French mandolines work great, but they often collect a penance in the form of a piece of your finger. Be wary. I even had to skip the safety shield and pusher so I could shove the whole squashes across. If you do that…may the force be with you. 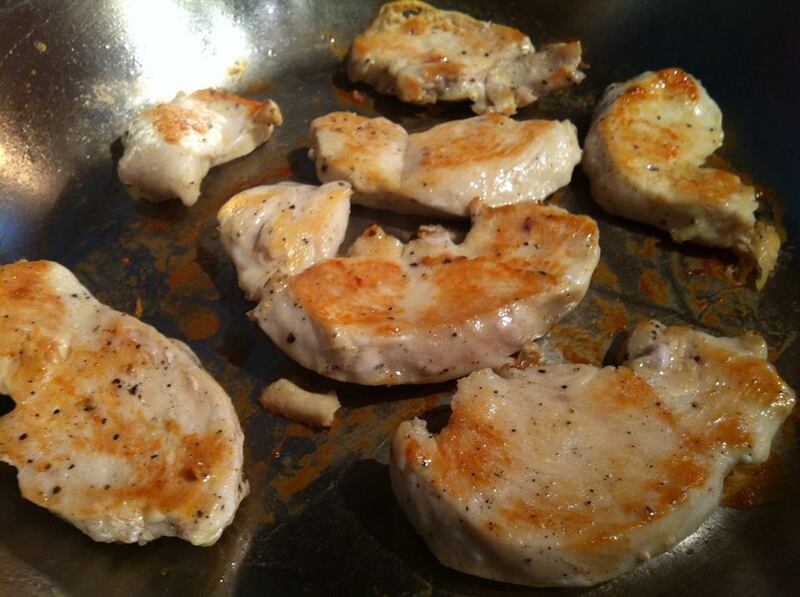 I had a couple large chicken breasts in the freezer, so I thawed them in the fridge overnight. I sliced them into 3/4-inch slices, seasoned with salt and pepper, and tossed them with a bit of olive oil. Then I seared the slices in a large, stainless steel (as in not-nonstick) pan and cooked until they were just done, turning once. They may stick a bit, but they should turn just fine when they’re properly seared. 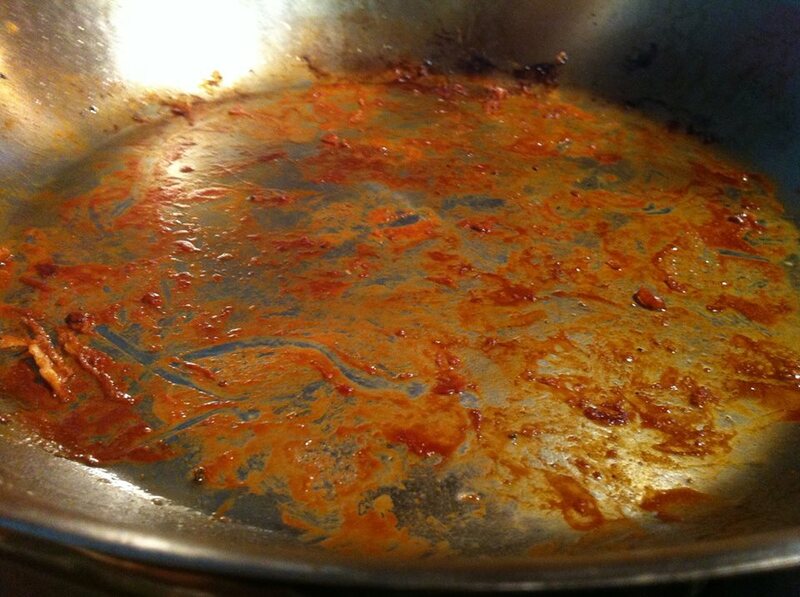 I moved the finished pieces out of the pan and into a separate dish, covered with foil, while I did a second round. Two chicken breasts made plenty for four people! Are you cooking along? Oh, good! DO NOT clean your pan. All those brown bits are about to make this dish amazing. This stuff is gold, people. If you scrub it off, we can’t be friends. I added a tablespoon (ahem, or more) of butter and cooked it until browned, which didn’t take long since it picked up some of the pan’s yummy goodness. Then I put in a half-cup or so of chicken broth to fully deglaze the pan (fancy terms for picking up all those yummy bits), whisking the whole time to scrape them up. The squash noodles went in next, tossed a bit with tongs. 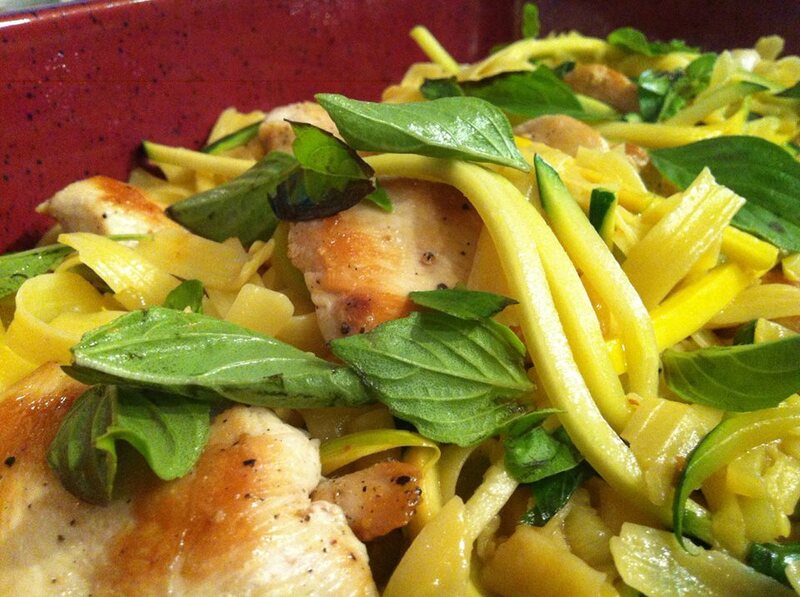 Then I added the GF noodles and half of my fresh lemon basil, tossing a bit over the heat. You can add the chicken back at this point if it needs reheating. The whole shebang now went into a serving dish, with the chicken (if you didn’t add it earlier) and the rest of the lemon basil. Top each serving with a bit of fancy salt, if you have it. I’m not writing this one out recipe style, so if you have any further questions, just leave a comment below! I went to the Farmers’ Market this morning and loaded up for the week…I am really enjoying not buying my produce (at least, for the most part) at the grocery. It feels good to know I am supporting Arkansas farmers, and that my family is eating well. Today, I bought a huge bag of goodies that I’ll have to figure out how to use. One trick of market shopping is not knowing exactly what you’ll find. Maybe as this blog grows, we can learn how to plan meals and cook for a week based on what is available. I bought yellow squash, zucchini, fresh blackeye peas, pepper sauce, roasted Marconi peppers, sun-dried tomatoes, the weirdest yellow-green sweet bell peppers, ground buffalo, a honey-molasses wheat baguette, and more cheese. Guess I need to visit Recipe Puppy and see what ideas come up. Generally, if I can find the basic idea of a recipe, I can take it from there and make it my own with what is available. I’ll let you know what we make! 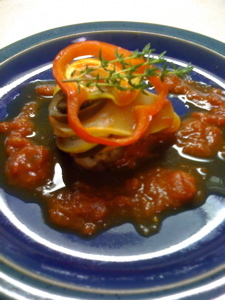 Meanwhile, I’ve been promising a little blurb on Morgan’s Ratatouille. If you’ve never seen the Disney movie, Ratatouille, I can highly recommend it. It’s not the same vibe of movie as other Pixar films, but if you are a foodie, you’ll love it. It’s all about the creation of something great and new from the ingredients you find, whether that be culinary or from life in general. 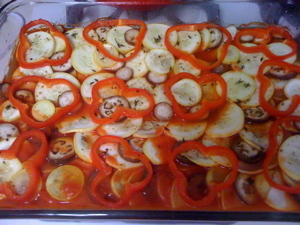 In the movie, the final dish prepared is an amazing dish of ratatouille, a traditional French tomato-base stew with squash, zucchini, peppers and eggplant. Honestly, in the stew’s original form, I’m not crazy about it. But in the movie’s culinary consultant was the illustrious Thomas Keller of The French Laundry, and his version (technically called Confit Byaldi) was quite different. Instead of chopping all the ingredients into a stew, he spoons a bell pepper and tomato sauce into a flat dish and layers the veggies, cut into thin rounds, on the top. Cover and bake. But, as most French recipes go, this recipe (although simple for a French cook) is a little bit much for even the Fancy Pants home cook. About a year ago, after a bit of searching, I found this simplified version here on Smitten Kitchen. This is what Morgan and I have made twice now, the second time with wonderful veggies from the farmers’ market. My only variation from this recipe is that I use my homemade marinara sauce rather than just tomato pureé. This time, we made it a bit bigger (because it was so yummy) and added the last of the fairy tale eggplants. We had left eggplant out of the first because we really don’t care for it, but the small ones are not so bitter. In the large photo above, you can see the final product. Next time I will take Keller’s advice and cook down all the extra liquid before plating. My sauce looks watery, but it sure was good! Recipes coming from market foodies besides myself soon, as well as more profiles.